Your childhood dream of having a decked-out treehouse just came true! Take your Hawaiian vacation to new heights with a stay at our stunning, and newly custom-built Treehouse! This indoor/outdoor, tropical getaway is ideal for outdoor adventurers, and the spacious digs welcome you back from a day of activity with a full kitchen complete with black leathered granite counter tops, custom mango wood cabinets, full fridge, countertop burners for cooking, water filtration system, and all the kitchen supplies needed to make your favorite meal! The bathroom features a custom floor to ceiling glass shower complete with mosaic tile flooring, with 100% solar powered water. Catch the gorgeous sunset views from the wrap around lanai or from the comfort of your spacious bedroom which comes with a custom king size Mango wood bed and dresser! The beautifully designed pocket doors from the bedroom to the lanai, slide fully open, allowing for the ultimate treehouse experience. 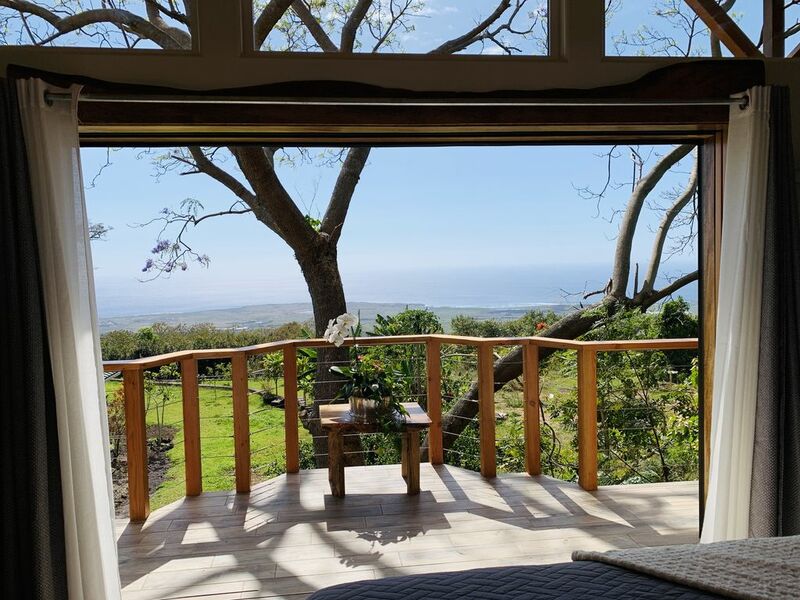 Nestled in the lush tropical rainforest on the Big Island of Hawaii, just 15 minutes from downtown Kona and 10 minutes from the Kona Airport, this getaway built in a Kukui Nut Tree lets guests reside 15 feet above ground with a gorgeous trunks going straight up through the center of the living space! The spacious, open floor plan is guaranteed to be your favorite spot, with full-circle views of the surrounding trees, nature and breathtaking ocean views. The bountiful farm also has over 100 different varieties fruit trees and a small pasture for our sheep. When available, our guests will also have access to fresh tropical fruit (depending on whats in season). If you're feeling adventurous, we have complimentary snorkel gear, boogie boards, beach umbrellas, and beach towels. Washer and Dryer facilities are located on main property. The kukui tree (Aleurites Moluccana) was designated the official state tree of Hawaii in 1959. The kukui is also called the candlenut tree (because the nut of the kukui was used for candles by early settlers). The blossom of the kukui is also the official island lei material of Moloka'i. The kukui tree is not native to Hawaii (originally from Polynesia).